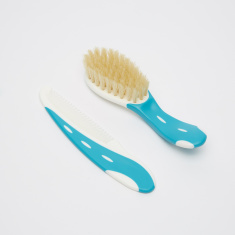 NUK Brush and Comb Set | Blue | Ergonomically shape. Shaped perfectly for the use of kids, this baby brush and comb will make your kid look neat and groomed. The soft bristles and rounded teeth will keep your kid's scalp getting scraped. Feature 2 : Gentle to baby soft hair and sensative head. Feature 1 : Ergonomically shape. Feature 3 : Soft bristles and rounded teeth combs .